These days lo-fi cassettes are rarely produced let alone played, yet here we are in 2007, (originally Canberra but now...) Sydney band Soft Tigers have put out their debut album "Gospel Ambitions" on tape. Started as carefree school friends, in hoping to create something new. They've been getting loads of radio play since sending in their demos to stations such as FBi and JJJ late last year and there is no denying their successful tracks "Mr Ice Cream Introduces" and "M.A.R.I.A" are insanely catchy involving hand claps, electronic beats, riff raff guitars, fun singalongs and shout outs. 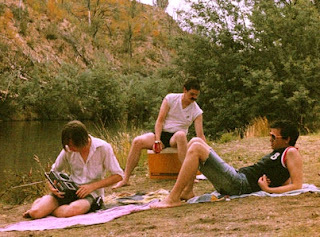 If I could think of a genuine young hearted Australian band, I would give the title to Soft Tigers. They've got that larrikin Australian touch that make you want to like them. Record label Below Par have sent us Soft Tigers' video to latest single "M.A.R.I.A", filmed by the band themselves. Throwing in mention of the Gaslight Inn on Crown Street, Darlinghurst; "M.A.R.I.A" is in response to reconcile differences with a girl named Maria. If you're after a fun Friday, check them out. Hopefully supporting Architecture In Helsinki next month should gain more fans. THANK GOD. I heard Mr. Ice Cream on the local university radio station, and I've been searching for it everywhere. I can now loop this continually and slip into a happy summertime dance party coma.